Take part in an exciting new initiative called YouGov Sada! Every day we will set a mini-poll with three questions on topical issues. The purpose is to understand what the world thinks in double-quick time. The results will be displayed as soon as you take part so you get to see them before anyone else! If you’d like to take part (no obligations, no incentives) all you need to do is download the FREE YouGov Sada App on to your smartphone. 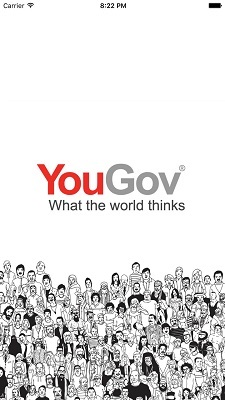 Simply search for YouGov Sada in the App Store or Google Play. Remember to enable notifications so you never miss your YouGov Sada daily mini-poll! Is it possible to login to the app with my YouGov account? The YouGov Sada app works in a slightly different way, if you are a YouGov panelist it is not linked to your YouGov panel account. It is therefore not currently possible to login to the app using your YouGov account. Can I earn points for participating in these polls? YouGov Sada surveys are not paid because they are not commercial work - they are not conducted for YouGov clients and there are no rewards or points for taking part other than the satisfaction of participating. Which we do hope you will continue to do. Can I change my answers if I've made a mistake? Unfortunately, not, once you have selected an option and moved on to the next question or to the end of the survey, it is not possible to change your answer. The ideas for questions and research are conducted by our team of YouGov market researchers in Dubai. I live in the Middle East but why can't I download the YouGov Sada app? The YouGov Sada app is currently available in the App Store and Google Play within the UAE, Saudi Arabia and Egypt, it is therefore unavailable to download by residents in other countries in the Middle East region. 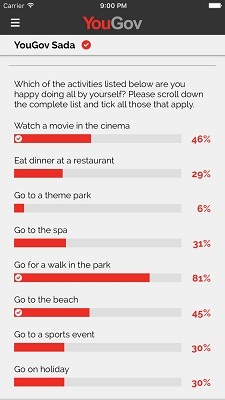 For what purposes is the data collected by YouGov? 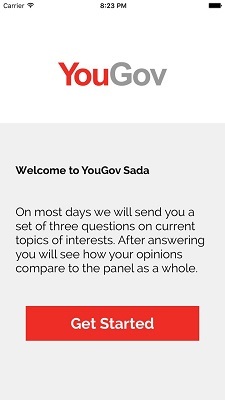 Data from YouGov polls on the YouGov Sada app are published within the app and on the YouGov website only. They are not used by any other third party. Will my opinon be kept confidential? Of course, your opinons will be added to those from other respondents who take part in each poll and the combined results will be published as percentages so your individual opinion is kept completely confidential.